S/Sgt. Albert N. Purcell, son of Mr. and Mrs. Wm. H. Purcell, attended CSTC, Edmond; husband of the former Dottie Mae Alexander. 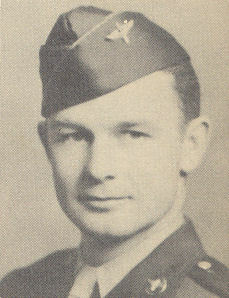 Entered Air Corps in 1942, trained in Sheppard Field, Camp Wolters, Texas, Las Vegas, Nev., Kearney, Neb., and Sioux City, Iowa; served in England, France, Germany, Austria, Belgium and Luxembourg; was Prisoner of War for twenty-two months.